Something or other happened in Tokyo in the late 80's/early 90’s that inspired musicians to evoke and emulate the latter period of the mid-60’s, a trend that began as a form of anti-pop but ended up being the signature sound of Japanese pop by the late 90’s. 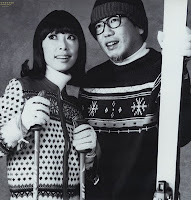 A couple dozen bands could have been filed under Shibuya-kei by the end of the 90’s, but my favorite was Pizzicato Five. P5 was a prolific and long-lived band, beginning back in 1979, and they released over two dozen records during their career. The band sustained a number of personnel changes, which eventually left only the duo of mastermind Yasuharu Konishi and the profoundly chic Maki Nomiya. Together, they produced the classic P5 sound before breaking up at the dawn of the millennium. Almost unfathomably stylish, they adopted references to mid-60’s British and American pop, some French yé-yé, and lounge, mixing in occasional touches of drum ‘n’ bass, house, and elements of sampling from DJ culture. This kind of thing was repeated later by non-Japanese bands such as Mono, The Postmarks, and Bittersweet, but with one important distinction: P5’s wit and whimsy puts a smile on your face instead of a shadow over your heart. They have inspired a second generation of Japanese musicians, such as Hideki Kaji, The Aprils , and The Lady Spade. Yasuharu Konishi seems to be still involved with his Readymade Entertainment label, and he wrote the score for a musical, Talk Like Singing, that ran in New York in 2009. Maki is still recording, performing as a solo artist, and blogs about culture and fashion. 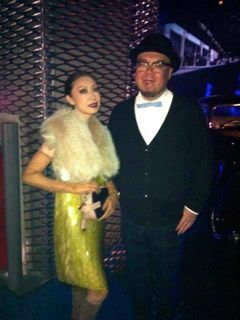 Here’s a recent picture of Maki with Yasuharu from her blog.